Day two of the RPS Advent Calendar holds a tasty treat, if you can reach it. John: Chuchel does something very, very few games have ever tried to do. Vignettes. While there has of course long been the madcap 5-second game modes of WarioWare and its various copies, Chuchel is something very different – something like mini-episodes of a cartoon, except as an outrageously cute puzzle game. 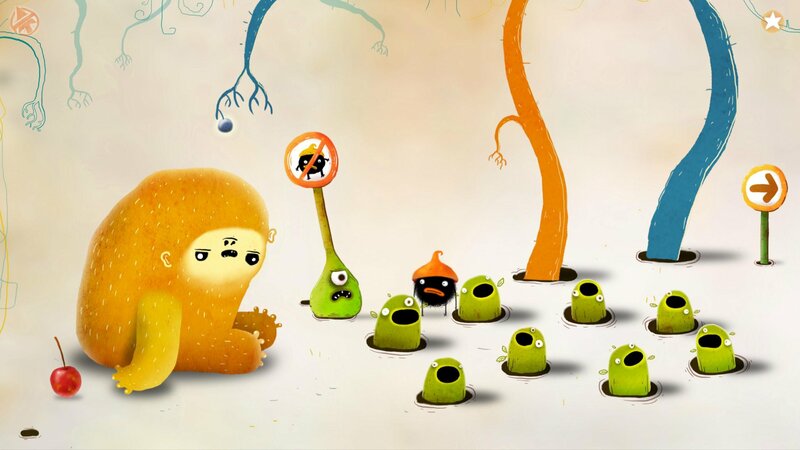 Each of the dozens of little scenes sees Chuchel, an ill-tempered and hungry ball of black fuzz, trying to get hold of a delicious cherry. Only to be thwarted by a red bug-like creature, the Jerry to Chuchel’s Tom. Or indeed a deific hairy hand that descends from the sky and just plucks the cherry away, ending a sequence with perhaps a nod to the animation of Terry Gilliam. This is Amanita, they of Machinarium and Botanicula, but in a far more silly and joyful mode. Where their games are usually whimsical and musing, this is anarchic and daft, a cacophony of happy noise and colour. And most of all, goodness me, it’s so, so funny. Playing Chuchel has been one of the absolute highlights of 2018 for me, not just because it’s a self-contained creation of joy and fun, nor just because it features exquisite animation and puzzle design, but because it was the very first time I’ve been able to properly play a game with my boy. 3 at the time, this was a game that let him make suggestions of what to do for me to try, in a way he instantly got. And even more than that, it was a game that had us both guffawing, sharing laughs in a way that really doesn’t happen often when there’s a 38 year age gap. It’s such a pure thing, pleasurable and ridiculous and with that slight edge of malevolence that makes all the best cartoons fun. Dave: If there’s one lesson to take away from Chuchel, it’s that a lot of hassle would be avoided if people shared more. Chuchel, a black doodle with an orange hat, is fighting with a rodent-like scribble over who gets to eat a single cherry, but their dispute frequently means they lose it entirely to some other creature. They team up together to try and get it, only to stab each other in the back with the rodent-scribble usually coming out on top. It’s very minimalist, each scene containing all the puzzle pieces needed to progress. The frantic art style and madness of what’s on display is strangely charming and by the end I was rooting for the black scribble to eat the cherry. But the thing that made Chuchel stand out to me was that it managed to tell a relatively endearing tale without uttering a single word. Characters talk gibberish, yet their gestures clearly show exactly what they desire and how they react to each other. It’s also one of the few games that nails slapstick humour, which is quite the feat. Very enjoyable for the short amount of time it takes to finish it. Looking to open another door? Head back to the RPS Advent Calendar 2018. Tagged with feature, The RPS Advent Calendar 2018.